Just a couple of announcements before I get started. The first is that there’s only a week left in November, and I’d love to have your support for my terrible moustache. Today is also your last day to donate and vote on how I shave my moustache for the next week. the details are on my site. 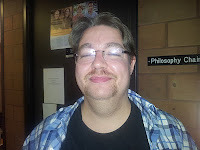 For the next week I’ll be posting pictures to my website of me out in public places showing off my moustache and raising awareness for men’s health. Or you can donate directly by going to my MoSpace. It’s for a good cause. Also, over the next month I’m going to be migrating the site to my own hosting. the domain will be the same, but you’ll likely need to update your rss. You can look forward to some major design changes as well, though there may be a bit of downtime. Anyway, on to today’s character. I’ve been itching to do another of these, and I thought of the perfect candidate the other night. I’ve spent a bit of time talking about heroes and the kinds of things they can teach us. That’s easy. they’re ideals that we can hold up and say, “We want to be like them”. But what about villains? What can the things they value teach us about how we conduct ourselves in our daily lives. the villain I use most often in philosophical examples is the Joker, who’s a quintessential utility monster, but today, we’ve got someone a little different. The star of today’s Pulp Philosophy is Lex Luthor. I’m gonna go out on a limb and guess that you’ve heard of Lex Luthor, Superman’s archnemesis, and not delve too deeply into his history. He’s brilliant, ruthless, and bald. He’s faked his own death, run a Fortune 500 company, been president, and done all manner of other nefarious things in the nearly seventy years since his creation. But he also has a lot of qualities which we admire, and it’s often these qualities which lead him to nearly best Superman. He’s a highly effective planner, using his brilliant scientific mind to imagine all kinds of ways to bring down Superman. He has an excellent work ethic, fully resolved to do whatever needs to be done to destroy his nemesis. He never takes vacations, and even in prison he’s constantly working toward his goals. He’s a leader, bringing together other like-minded people and directing them toward a common goal. Say what we will about his ethics, he gets things done. At least until he’s foiled by Superman. And he does it all with no superpowers, just plain old elbow grease, ingenuity, and the occasional shooting. One thing we can learn from him is to ask how far we’re really willing to go to get what we want. 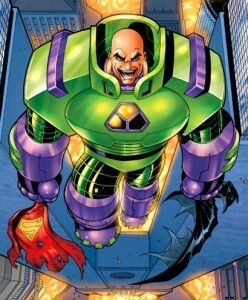 Luthor wants what Superman has so badly that he creates amazing edifices and brilliant inventions, and these things are merely a means to get him what he wants. he became president, and has been to jail more than once. Think about the things that you want. What would you do to get them, realistically? How much would you sacrifice, and how dirty would you get in order to obtain these things? With those questions comes another one that’s been posed to Luthor time and time again. Is what you want really worth that? Why is destroying Superman so important? We work really hard for things, but sometimes we lose sight of why we’re doing it. I’m not saying the effort is wasted, maybe destroying Superman really is that important, but the real lesson we get from Luthor is that we always need to keep that justification in mind. When someone asks you why you’re working toward a goal, that means it’s not obvious to them, so be able to make that clear both to them and yourself. Another is not to give up. I go on about this a lot, but I think Luthor serves as a pretty good example. He is trying to kill Superman. Superman. You know, bulletproof, flies, breathes in space, basically godlike Superman. If we want to talk about big, hairy audacious goals (and we will), that’s one of the hairiest. he fails over and over again, but he doesn’t quit. Superman comes and punches his whole plan down around his ears, and he just comes up with another one and goes right back at it. Let’s forget for a moment that his goal is the death of another sentient, and focus on the tenacity with which he works to achieve it. When he gets beaten, he vows to get Superman one day, and then he tries again. Imagine if you missed out on an opportunity, or failed to achieve a goal, and instead of abandoning it, you did what Lex Luthor does, dusted yourself off, and tried again. Every time. I wish I had half his persistence, really. I could go on about him for hours, but I’m going to cut it short this week on account of having research papers to write. To put it succinctly, Lex Luthor teaches us not to give up when our goals seem impossible, to be willing to work for them if they really matter, and to decide what it means to really work for them. As well, he shows that we ought to always ask “Why are these goals worth having?” That’s all for now, and please donate and vote at my MoSpace. Once again, the details for the auctioning of my moustache are here.